Take a moment and think back to a last conversation you had. Did you care about the topic? Is it your cause? Did you have something to contribute? Did you care about the people? Were you interested to listen to what they had to say? In great workshops participants engage in conversation. As facilitator we can only stimulate such engagement. It is part of the preparation process to clarify participants’ interests and questions regarding the topic. It is important to know how strongly a group is already connected to a topic and to each other. How do we motivate participants to get involved and engage? The trouble is that a workshop situation is somehow artificial. A workshop is designed by the facilitator’s hand. In a good design it should feel natural and comfortable for participants to engage. When conversations flow the framing work is well done. Framing is the crucial step. We aim for everyone to feel involved and to have agency. As facilitator we want everybody to feel welcome and at ease. Therefore the first chunk of workshop time is dedicated for participants to arrive and to connect. They warm-up to each other. Trust is the crucial ingredient we have to foster. Openings are about coming fully into the present and connecting with self, others and the purpose for the gathering. Precious knowledge is in participants’ heads, it is implicit and tacit (see more on Nancy Dixon’s post). Participants bring in different perspectives and experiences that enrich the discussion. As facilitator we care to hear all voices. 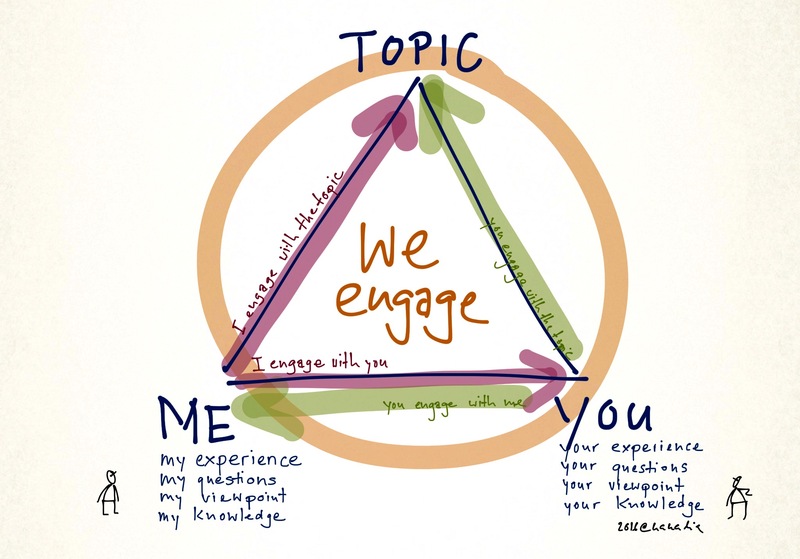 When participants feel connected and comfortable their readiness to share and engage is higher. We have a mix of people in the room (and often hierarchies too). Not everybody feels at ease to speak out loud. We work with fast talkers, silent thinkers, slow movers, loud voices, writers and readers, visual thinkers, storytellers and sketchers. All have their share. Introverts aren’t shy! They’re exhausted and they need to step away from others to think things out or recharge. Playfulness is lightness, is easiness. Playfulness brings laughter in the room, a touch of humor, happiness. Playfulness opens up our minds. Playfulness can be a poem, an introduction ‘game’ or a doodling exercise. Music and colors bring playfulness. Moving our bodies and minds is refreshing. Why not talk when participants walk. Association games open up our mind and stretches our thinking. What is needed is the tight dose of playfulness adequate to the setting. Including a playful spirit is part of the preparatory framing work. Laughter, playfulness, and joy. All three. At the same time. Yes. Yes. This is the experience. This one. The one that combines laughter with playfulness with joy. As facilitators we inspire, invite, we connect, we weave, we lead from the background, we are ready to experiment, we are playful. How beautifully simple and helpful. I love it Nadia. Thank you for your engagement.